WALNUT STUFFED EGGPLANT RECEIVES APPLAUSE! How nice it is to be able to serve a vegan entrée that makes people say WOW! That wonderful compliment came my way very recently at a luncheon attended by 80 non-vegetarians. The luncheon was held at a very large hotel and conference center. When offered the entrée choices of Rosemary Sage Chicken with Piccata Sauce, Roast Salmon with Red Wine Sauce, or Vegan Walnut Stuffed Eggplant, 21 of the 80 people attending chose the eggplant dish–one of my very favorite recipes from The Nut Gourmet, my cookbook that was published in 2006 and is still in print. Especially rewarding was the lively applause when the chairwoman announced the entrée was my recipe. I really wanted to thank the chef for accepting my recipe and preparing the eggplant entrée. I asked if was possible to speak to the chef. It seemed rather unusual for the chef at large hotel to even be willing to prepare a recipe from a patron. Within a few minutes, the chef came out with a smile. Desi Szonntagh is the executive chef at the hotel. After we chatted a bit, he said he really liked the recipe and felt it was a good idea to introduce his kitchen staff to something unique. He also appreciated the opportunity to experience something vegan that was not just pasta with vegetables. If you have family members who really love eggplant, and you serve this delicious entrée, better get ready to receive a few WOWs of appreciation. I have no doubt you’ll agree this is one very killer delicious dish! This recipe is a hearty Mediterranean dish with Greek ancestry and is pure heaven to walnut and eggplant lovers. Its exceptional flavor comes from the combination of cinnamon, tomato paste, and capers. 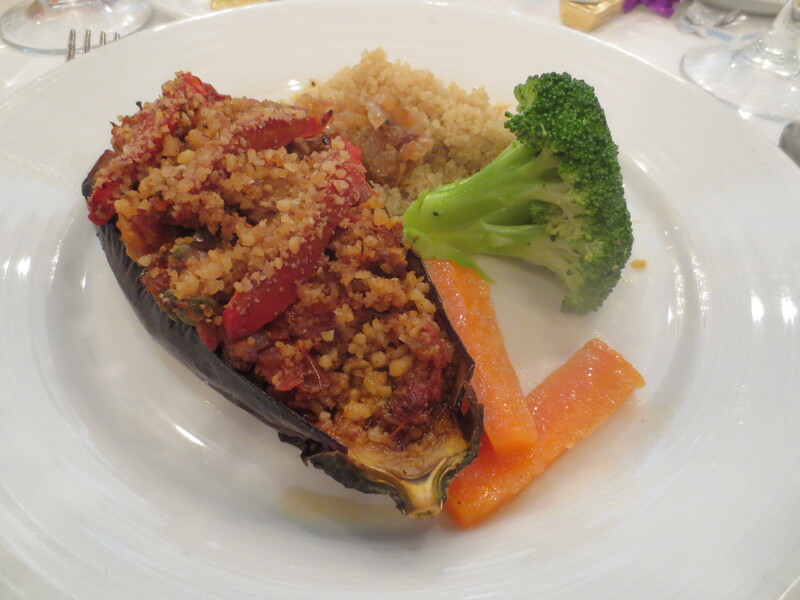 Because the stuffed eggplant is so special, I keep the rest of the meal simple with stir-fried or steamed vegetables, bulgur wheat in place of a rice dish, and a tossed salad. Cut the eggplants in half lengthwise, slicing through the stem end. 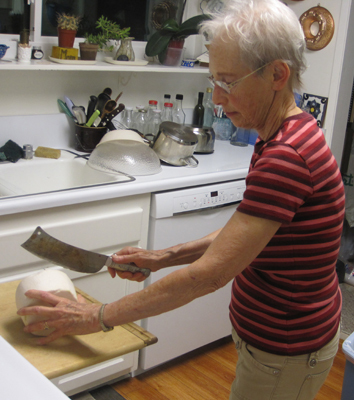 Using a curved, serrated grapefruit knife, scoop out the flesh, leaving a 1/4-inch shell, and coarsely chop the flesh. Put the chopped eggplant into a large, deep skillet or flat-bottom wok. Rub the inside of the eggplant shells with a small amount of olive oil and place them on a baking sheet. Place the eggplant shells under the broiler, and broil them 3 inches from the heat source for 5 to 10 minutes, until fork-tender. Watch carefully to prevent burning. Remove the eggplant shells from the broiler and set them aside. Preheat the oven to 375 degrees. Add the chopped tomatoes, mushrooms, onions, garlic, olive oil, salt, cinnamon, and pepper to the skillet with the chopped eggplant, and cook and stir for 7 to 10 minutes, until the vegetables are tender. Coarsely grind the walnuts in a hand-crank nut mill and add 2/3 cup to the skillet along with the tomato paste and capers. Mix well. Fill the eggplant shells with the vegetable mixture and sprinkle the tops with the remaining 1/3 cup coarsely ground walnuts. Top with the tomato slices. Sprinkle with salt and pepper, and bake uncovered for 25 to 35 minutes. My favorite remedy is to carpe diem and peel those softies. I then cut them into 1-inch long chunks, put them on a metal pie pan, and tuck them into the freezer. 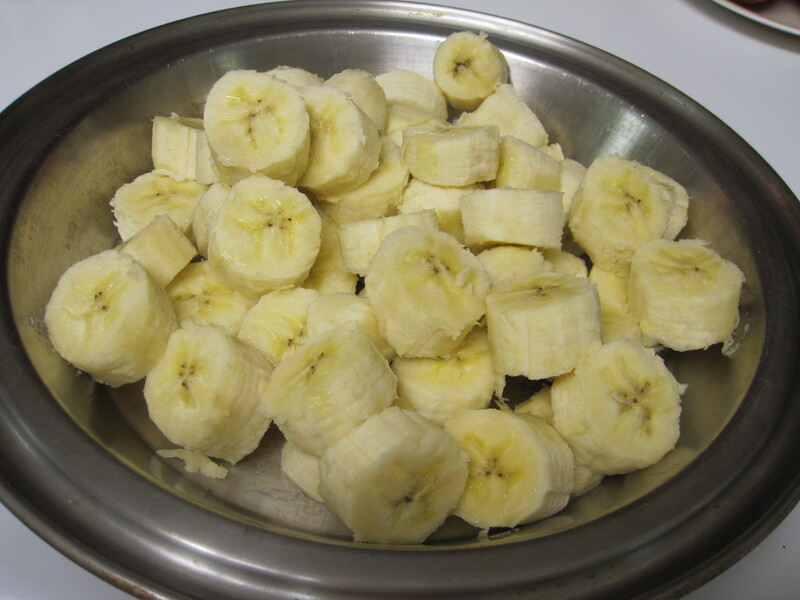 The banana chunks can go to sleep in the freezer for ages until you’re ready to put them to work. If you’re still enjoying some pretty darned hot weather like I am in Los Angeles, you can whip up a delicious dessert that takes no advance prep. Gather up those bananas, some dates, peanut butter, lime juice, and vanilla extract and toss them into the food processor. You’ll have to fiddle with the processor a bit, stopping, redistributing, and starting again several times, but the end result is pure nirvana for us peanut butter nuts. 1. Combine all the ingredients, except the chocolate syrup, in a food processor. Pulse and process several times. 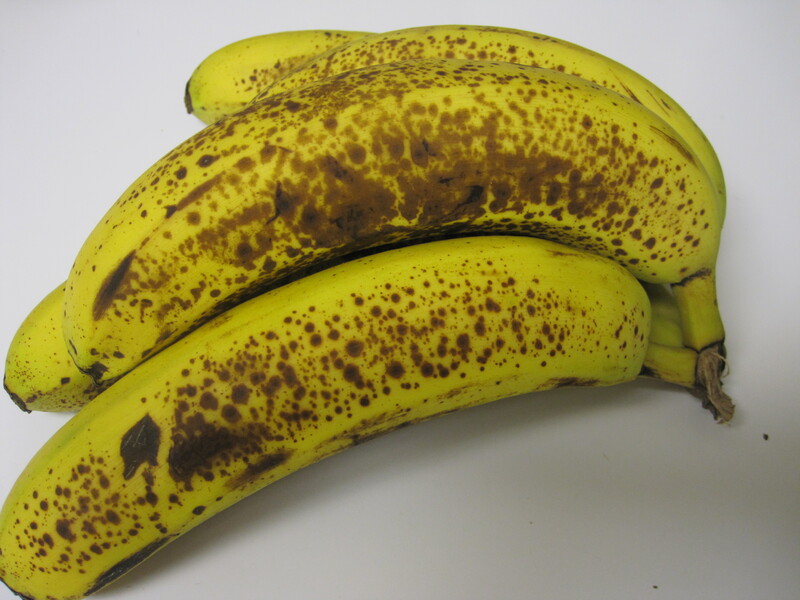 Because it takes time to break down the frozen bananas, you’ll need to stop the machine several times and use a firm spatula to redistribute the ingredients. 2. Be persistent and within a few minutes, you’ll be able to process the mixture into a thick and creamy, ice-cream-like dessert that will feel refreshingly cold as it glides down your throat. 3. Spoon the mixture into 4 dessert dishes and top with the chocolate syrup, if desired. Pie making was always something I feared and completely avoided because I was frightfully intimidated by the finicky nature of traditional flaky pie crust. Getting it right takes some skill and perseverance. Whenever I did venture into pie-crust territory, I could never got it right. The crust was either too wet or too dry to roll properly and the finished pie never looked like it ought to. Quite honestly, I was a pie crust flunk-out and my pies were a flop. My pie crust self-esteem was so low I didn’t touch a pie recipe for years. Going vegan opened up a whole new world of ingredients and inspired me to use those items inventively. The solution to overcoming pie phobia was to focus on my new, UN-traditional pantry and experiment with different ingredients that could hold a pie together without the fuss and fear of failure. These recipes work every time. If I can make a successful pie crust, so can you. The following pie crust recipes are for pies that require only a bottom crust. The complete pie recipes can be found in my just-released cookbook Vegan for the Holidays available on Amazon and at Vegetarians in Paradise. Dessert lovers can never have too many desserts! If you’ve made extra desserts for your holiday celebrations, I have no doubt you’ll be happy to store the leftovers and feast again next day. As you probably know, second time around is always better and gives you something sweet, spicy, and holiday-perfect to look forward to. Here are four unique pie crust recipes–3 are ideal for dessert pies–1 recipe forms the base of a savory, dinner pie. This very quick prep featuring walnuts belongs to two tantalizing recipes: Williamsburg Pumpkin Pie and Apples ‘n’ Cream Pie. Both these dessert pies bring the Thanksgiving meal to a delicious and satisfying conclusion. They look appetizing and taste so good you just might want a second helping. 1. Pour the oats into a food processor. Pulse 12 to 15 times. Add the walnuts, oil, sugar, maple syrup, lemon juice, and salt. Process until the mixture is a fine, crumbly meal and holds together when pinched. Stop occasionally to scrape down the work bowl. 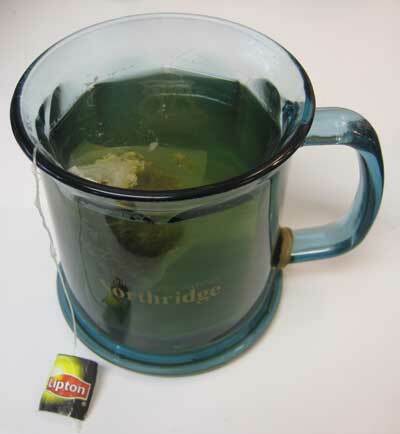 If needed, add 1 tablespoon of water to help it hold together. 2. Spoon the mixture into a 9 or 10-inch pie pan and press it firmly and evenly into the bottom and up the sides of the pan with your fingers. Press on the edges to firm. Add your pie filling and bake. 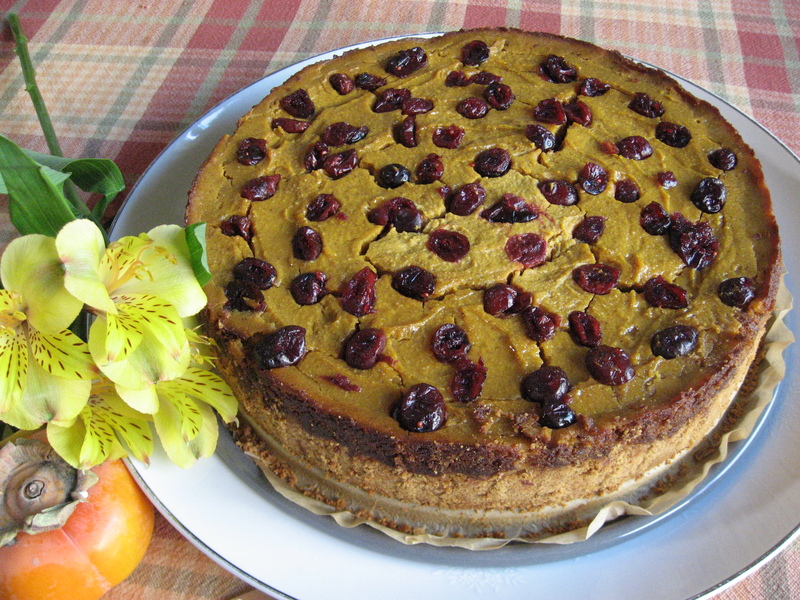 This simple recipe forms the crust of the Easy Pumpkin Tofu Cheesecake in the dessert section of the Thanksgiving menu. The recipe requires no high-tech culinary skills–only your fingers to press it into the pie pan. 1. Put the almonds in a food processor. Process until they form a coarse meal. Add the flour, ground flaxseeds, brown sugar, and salt and process until thoroughly mixed. Add the water and canola oil and process until the mixture becomes a moist, soft dough. Stop occasionally to scrape down the work bowl. 2. Spoon the crust mixture into the prepared pan and use your fingers to press it firmly into the bottom and up the sides of the pan. 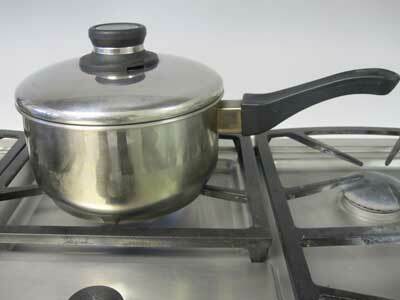 If using a springform pan, press the mixture into the bottom and only 1-inch up the sides. Add the filling and bake. This very unique crust belongs to a scrumptious, Italian-inspired, savory main dish. 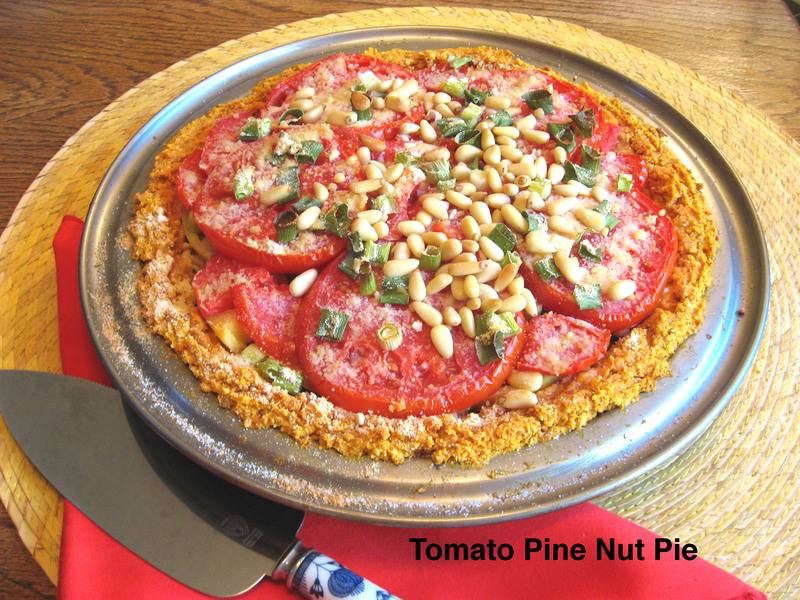 Tomato-Pine Nut Pie makes a delicious entrée on the Christmas menu of Vegan for the Holidays. It’s melt-in-the-mouth delicious and decked out with plenty of holiday spirit. 1. Preheat the oven to 350 degrees F. and lightly oil a 9-inch pie pan. 2. Put the sweet potatoes in a 2-quart saucepan with water to cover. Cover and bring to a boil over high heat. Decrease the heat to medium and simmer for 5 minutes, or until the sweet potatoes are fork-tender. Drain the sweet potatoes well, transfer them to a large bowl and mash them well. Set aside. 3. Put the almonds in a food processor. Process until they are finely ground yet still retain a little texture. Add the tofu and salt and process until well incorporated. Stop occasionally to scrape down the work bowl. Spoon the tofu mixture into the bowl with the sweet potatoes and mix well. 4. Spoon the sweet potato mixture into the prepared pan. Use your fingers to press it onto the bottom and up the sides of the pan. Build up the sides of the crust 1/2 inch higher than the pie pan. Bake the crust for 15 minutes and let cool. 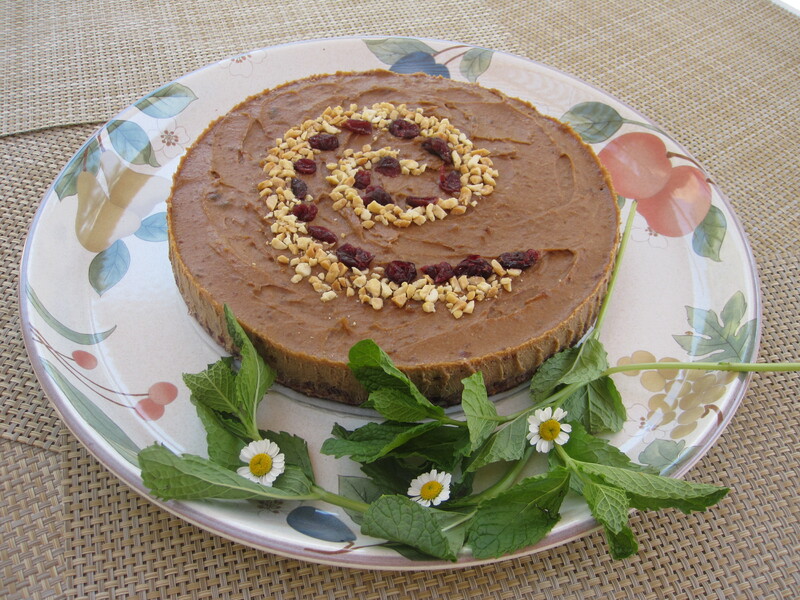 This crust recipe is super-easy and belongs to the tangy, deliciously crunchy base of the NO-BAKE Cinnamon-Peanut Butter Torte, an awesome dessert you can prepare in a springform pan two or three days in advance and freeze. Ten minutes before serving, transfer the pan to a platter, and remove the springform collar. Garnish, cut into wedges, and enjoy the compliments. 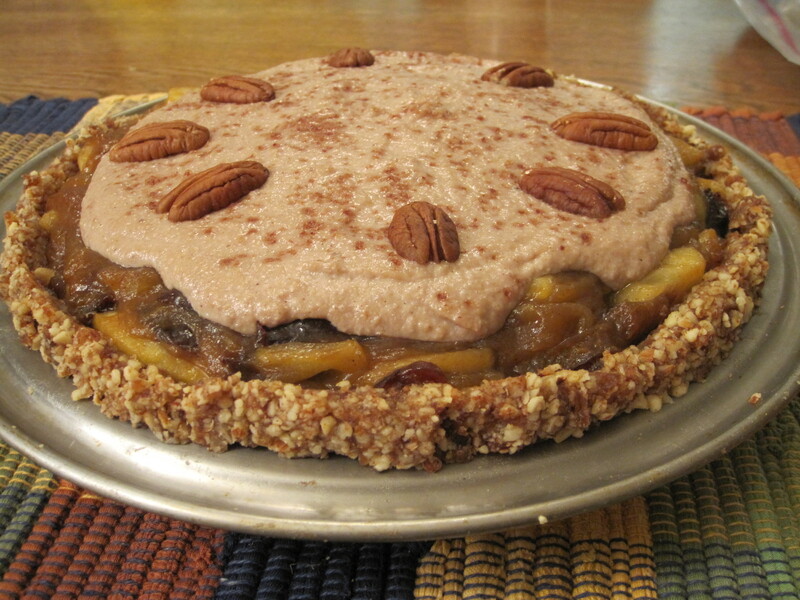 You’ll find the complete recipe for each of these enticing pies in Vegan for the Holidays. 1. Cover the base of a 9-inch springform pan with a piece of parchment paper 2 inches larger. Snap the collar back onto the base, and cut away the excess parchment with scissors. Lightly oil the sides of the pan and set aside. 2. Put the almonds in a food processor. Process until they become a coarse, slightly chunky meal. 3. Add the cranberries and water and process until the cranberries are broken down into tiny bits and the mixture holds together when gently pressed. Stop occasionally to scrape down the work bowl. Add water 1 tablespoon at a time if the mixture is too dry to hold together. Spoon the crust mixture into the bottom of the springform pan and press the mixture firmly with the back of a spoon to distribute it evenly. Add the filling and freeze until ready to serve. GOING COCONUTS IN THE PHILIPPINES!!! In preparing to write an article on vegan Filipino cuisine for Vegetarian Journal, I began researching the intriguing array of ingredients typical to the cuisine of these faraway islands. Always on the hunt for dishes that feature nuts in their recipes, I was amazed to discover how extensively employed coconuts are in everyday Filipino dishes. Liberally used are not just coconut milk and coconut cream, but also everything from the sweet water of the young coconut, the young coconut meat (buko), and the meat of the mature coconut (makapuno). All are included in some form in numerous home-style recipes and beverages. The mention of coconut water brings warm memories of a recent visit to Manila to see my son, who has been living in the Philippines for many years. Seems I had a good excuse to hop on a plane with my husband and enjoy exploring many corners of this fascinating country. While visiting, I always look forward to the fortifying snack of young coconut, so readily available at snack stands or markets. 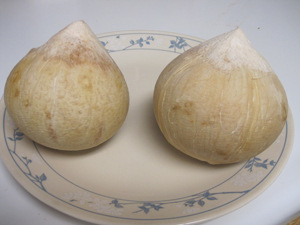 You can easily recognize a young coconut by its slightly off-white fibrous skin and its dramatic, cone-shaped top. The place is hot, really, really hot and humid, and it’s easy to feel like you’re melting away. We discovered that a young coconut is the quickest way to restore the soul with invigorating comfort. The cool, refreshing, and naturally sweet coconut water works like magic to bring relief from the oppressive climate. The coconut water is refreshing for good reason–it’s high in potassium, calcium, and magnesium and low in fat. 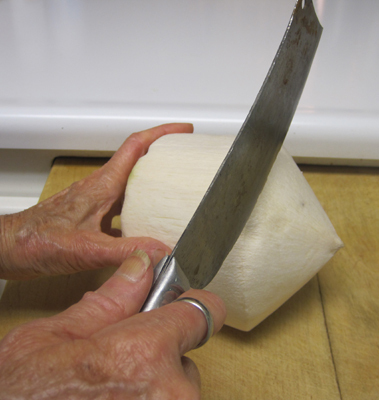 To reach the coconut meat, an experienced coconut aficionado is usually on hand to open the tough shell with the skillful whack of a frightfully wicked-looking knife. 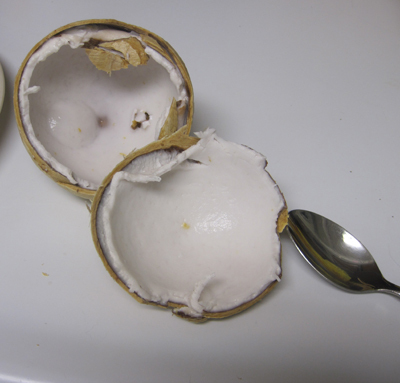 Within moments, I was plunging my small plastic spoon into the thin layer of soft, quivering, jelly-like coconut meat. So what’s a young coconut like to eat? It depends on the maturity. Texture-wise, a young coconut is spongy soft, gelatinous, and delicately sweet. The delicate flesh of a really young coconut is so airy and satin-like that within three or four spoonfuls, it’s gone in a whisk. One that’s a little more “mature” might have sweet, slightly firmer meat, but never as firm as the fully mature crunchy, shredded coconut used for baked goodies. Because the meat of the young coconut amounts to no more than just a few spoonfuls, it refreshes and comforts completely without leaving one overfull. It’s one of my favorite snacks. If left on the tree to mature completely, that coconut would contain the familiar firm, chewy, white meat that turns up in supermarkets as sweetened, shredded or dried, grated unsweetened coconut. When I returned home, I found myself craving young coconut. I hadn’t paid much attention to coconuts before. Just thinking about how to open one seemed daunting. But now that I’ve seen how easy it is, I thought I would share a few simple steps with you. First, you’ll need to drink the coconut water or pour it into a container and refrigerate it to enjoy later. 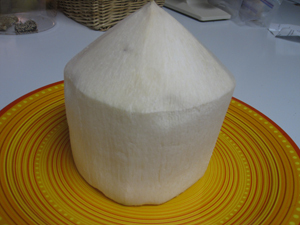 You can use hammer and an awl or firm, pointed tool to poke a hole in the top of the coconut. The hole should be large enough to poke in a straw so you can sip the delicious beverage leisurely. Alternatively, you can lay the coconut on its side and whack the top 1 1/2 inches off with a very firm, sharp clever. You’ll have to give it some really aggressive blows to accomplish this. Though the meat is ultra soft, the shell is tough as nails. 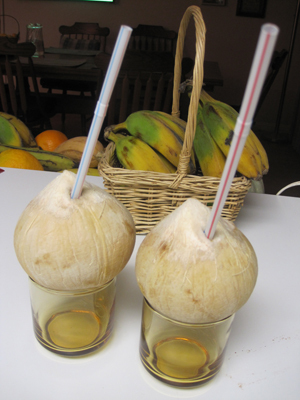 You can then put your straw into the coconut or tip the coconut and pour out the water. You may lose some of the delicious water in the process until your coconut-opening skills improve. To enjoy the young coconut meat, the only tool you’ll need is a spoon to simply scoop it up, one delicious spoonful at a time. There’s a considerable distinction between the water of a young coconut and that of a mature coconut. Young coconut water is sweet, delicious, and nourishing, while the water of mature coconuts is not sweet and usually discarded. Coconut cream and coconut milk are extracted from mature coconut meat. You might say we’re a bit spoiled because we can easily go to the grocery and buy both coconut cream and coconut milk in cans. Because this convenience is so available, most of us are unaware of the laborious and time-consuming process involved in extracting coconut milk. If you’re a do-it-from-scratch cook, you’ll relish the process: It’s not difficult, just time consuming. First, pierce the three eyes of the mature coconut using a hammer and awl, and discard the coconut water. Then, use a hammer to crack the coconut open. Scoop out the flesh, and chop it into thumbnail-size pieces. 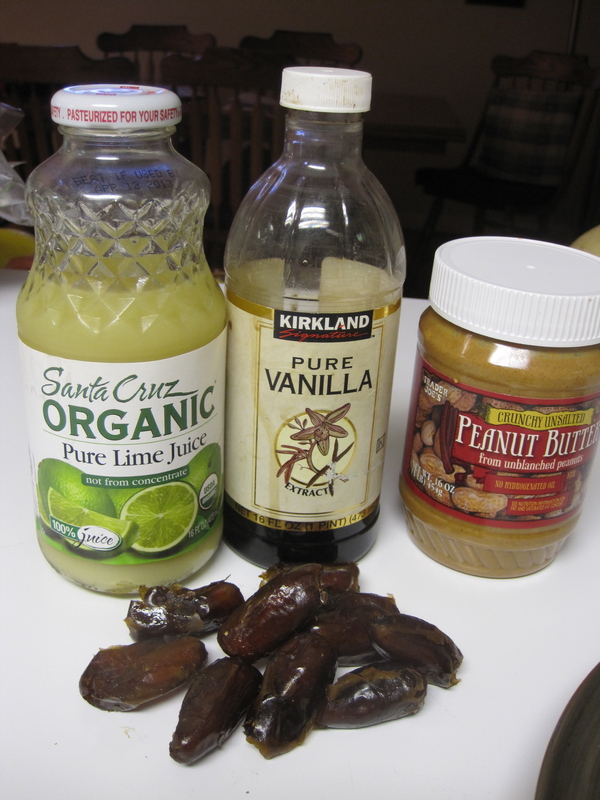 Put half of them into a blender with 1 1/2 cups of hot water, and blend for about 30 seconds. Line a bowl with several layers of cheesecloth large enough to drape over the sides and pour in the blender contents. Lift up the cheesecloth and squeeze to extract the liquid. This liquid, the first pressing, is rich, thick, full-fat coconut cream. Repeat with the other half of the coconut meat. For coconut milk, put the coconut meat back into the blender with about 1 cup of warm water and process. Extract the liquid by pouring and squeezing the liquid through the cheesecloth. The result will be medium-fat coconut milk. To make low-fat coconut milk, follow the same procedure a third time, using about 1 cup of warm water in the blender. To many people living outside the major cities in the South Pacific, extracting coconut milk is common practice. 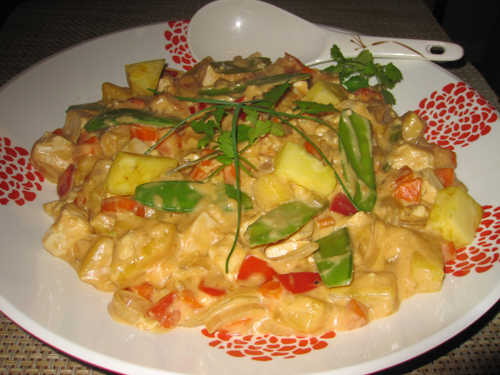 Below is a delicious, celebratory Filipino main dish that features coconut milk and pineapple, two food treats that are grown throughout the islands. The dish is super easy to make because the ingredients list and the process are so short, you’ll have it done in 3 steps. Serve it over rice for a winning meal. An everyday staple of the Filipino diet is white rice, but brown rice is so much healthier. I like the short-grain brown rice because of its chewy nature and its stickiness, similar to sticky white rice but much better for you because of its higher fiber content. It’s available in Asian markets or natural food stores and takes about 35 to 45 minutes to cook. You’re about to shake hands with Pinnyahang Manok, a rich, flavorful Filipino coconut milk and pineapple dish. The actual Tagalog translation is Pineapple Chicken Stew, so you can see I’ve taken a traditional Filipino chicken dish and applied a little kitchen magic to turn it into a delicious vegan delight. I’ve also lowered the fat content considerably by using the water-sauté method to cook the onions and carrots rather than sautéeing in oil or butter. 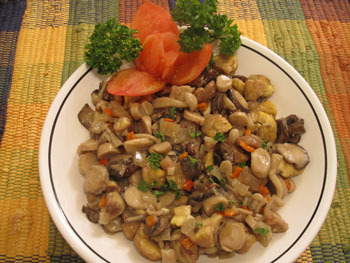 Another departure is the addition of oyster mushrooms, which do not typically appear in this island dish. The mushrooms definitely do add a tasty touch, yet keep the dish delicately flavored to show off the coconut milk and pineapple. This recipe, seasoned simply with garlic, salt, and a bit of miso, makes a mouthwatering, light summer meal served over brown rice. Enjoy! 1. Combine the onion, carrot, and garlic in a large, deep skillet. Add 3 or 4 tablespoons water and water-sauté the vegetables over high heat, stirring frequently, for about 5 to 8 minutes, or until the onions are soft and transparent. Add 1 or more tablespoons of water as needed to cook the onions and carrots and prevent burning. 2. Add the tofu, mushrooms, coconut milk, and tomato and cook about 2 to 3 minutes. Season lightly with salt and pepper. 3. Add the pineapple chunks and snow peas and cook for 1 or 2 minutes. Adjust the seasoning with the miso and salt. Want to make fresh coconut milk at home? It’s easy. All you need is the grated flesh of one mature coconut, which makes about 4 cups grated flesh. To save time, buy frozen grated coconut flesh in an Asian market. Allow it to thaw completely and combine it with 1/2 cup of water in a bowl. Squeeze the flesh with your hands and you’ll soon have rich coconut cream. Strain the coconut cream. The flesh is still perfectly usable and makes a great addition to a fresh salad. If you’re aiming for a low-fat coconut milk, strain and reserve the coconut cream, and knead the flesh again with about 2 to 2 1/2 cups of water for a really thin, low-fat coconut milk. Adding about 1 to 1 1/2 cups of water will result in a medium-fat coconut milk. Strain and enjoy. CHOCOLATE PASTA SAUCE? A NUTTY IDEA! 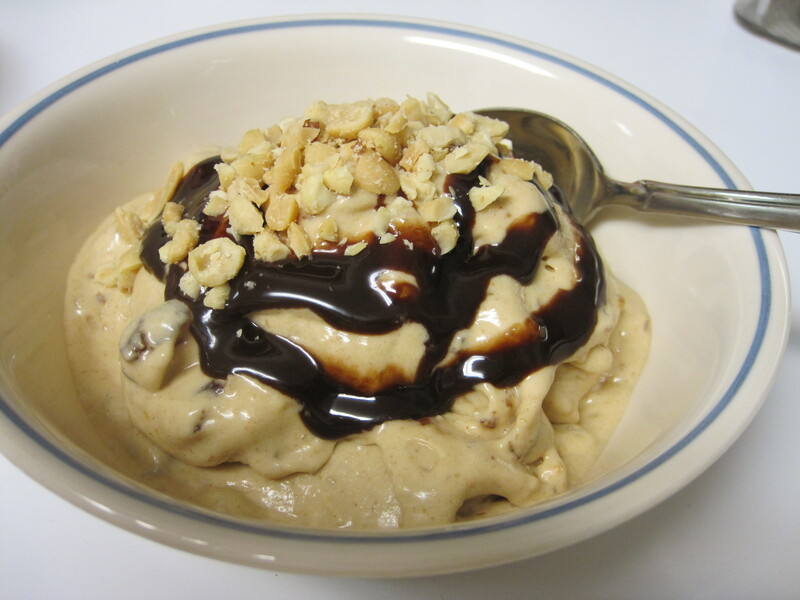 Combining two dynamically healthful foods–walnuts and chocolate–seemed like a wildly awesome idea, but then, what to do with those two items that end up as a truly original dish — one that almost jumps off the plate and starts to sing. Walnuts and chocolate already meet up in a ton of cookie, cake, muffin, and dessert recipes. So I had to take that great little duo on a totally new journey into the unknown. That started my crazy little brain thinking about a savory dish, rather than one that’s sweet. I had just bought a big bag of tomatoes and was planning to make a traditional Italian pasta sauce for dinner. Then–click–on went a buzzer. A sizzling idea was arriving! Before long it took shape–and yes–the idea sounded like a possibility–admittedly, a crazy possibility. The idea was so potent I could barely control its compelling tug. No use fighting the urge, so off I went to the kitchen and began to assemble a delicious, from scratch, homemade pasta sauce with chocolate. Yep, that’s the nearly uncontrollable idea that mentally dragged me into the kitchen and forced me to make pasta sauce with–OMG really?– chocolate. 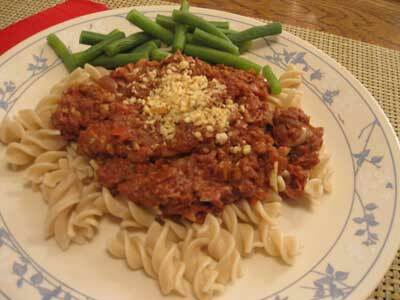 The traditional pasta sauce itself is actually rather easy and tasty, but not extraordinary. What is exceptional is the addition of chocolate–unsweetened chocolate–the kind one uses in baking. The finishing touch was the coarsely ground walnuts that added not only divine texture, but also a wealth of wholesomeness to the dish. The scrumptious result was a beautiful, sable-hued pasta sauce with such depth of flavor it simply stood out as irresistibly delicious. Looking at the sauce, no one would ever guess it contained chocolate. Not even tasting the sauce would reveal its secret ingredient. The chocolate is simply hidden within the delectable molecules and oozing with savory richness. So NutGourmet fans, serve this pasta sauce with gusto–and don’t let the secret out of the bag! It’s ours–just ours, and we’ll keep it that way! 1.Combine the tomatoes, onion, garlic, olive oil, oregano, and pepper in a large, deep skillet. Cook and stir over medium high heat for about 5 minutes. Decrease the heat to medium and simmer, stirring occasionally, for about 15, or until the tomatoes are well broken down and the onions are soft. 2.Add the chocolate and stir continuously for about 2 minutes, or until it is completely melted and thoroughly incorporated. Add salt to taste and cook another 10 minutes to blend the flavors. 3.Just before serving, stir in the walnuts and mix well. Cook another minute and serve. Note: And don’t forget the Homemade Vegan Parmesan. Scroll down on the page past kale salad recipe. Do you ever yearn for a breakfast dish that’s playfully indulgent– deliciously sweet, but not too sweet—- a bit of crunch, but not too crumbly—- healthful, but still a tad naughty? I sure do. These tasty oat squares are a variation of a recipe in my cookbook, The Nut Gourmet, but I’ve taken them to a more daring level. These neat little breakfast treats have a pleasant little snap to them. Nice thing is that they can be made a day or two ahead and stored in the fridge until you’re ready to enjoy them. They’re best served warm, so tuck them into a preheated 350-degree F. oven to warm for about 5 to 6 minutes. Bring one or two flavors of your favorite jam or fruit spread to the table along with the Creamy Tofu Topping recipe below. Then spread an oaty cake with a lashing of jam, and spoon a dollop of Creamy Tofu Topping over the jam. Now, take a bite— WOW! It’s glorious— somewhat crunchy—-and a little chewy— and definitely creamy—-ahh! perfectly sweetened. It’s positively sensuous and will make you feel pampered and coddled with self-indulgence. But, hey, isn’t that a bit of OK! What happens if you crave these often? No problem—-the recipe is easy—-make ‘em again and again! Serve these with fresh fruit on the side—-perhaps a fruit salad–maybe cut up fruit slices— or simply bring the fruit bowl to the table with a knife or two and enjoy the fruit informally. And don’t forget that steaming cup of tea or coffee to complete this perfectly naughty breakfast. 1. Preheat the oven to 350 degrees F. and have ready a dry baking sheet and a rolling pin. 2. Put 2 cups of the oats in the blender in batches and blend briefly to create a coarse oat flour. Transfer the oat flour to a medium bowl. 3. Add the walnuts, brown sugar, baking powder, and salt and mix well to distribute the ingredients evenly. Add the water, canola oil, and almond extract and use the back of a spoon to mix into a thick, moist dough. 4. Sprinkle 1/2 cup of the remaining oats on the counter top or work surface and spoon the dough over the oats. Sprinkle the remaining 1/2-cup of oats over the top, covering it completely. 5. 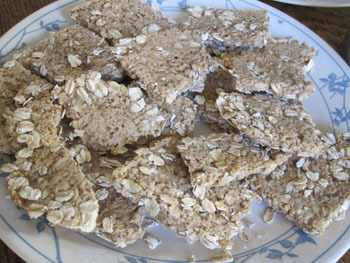 Roll the oat-covered dough into a rough rectangle to a thickness of about 3/8-inch. Using a flatware knife, cut the dough into 2-inch squares or rectangles and use a metal spatula to lift them onto the baking sheet. 6. Bake for 15 minutes. Turn the cakes over and bake 10 to 12 minutes longer. Transfer to an attractive serving platter and enjoy. Put all the topping ingredients in the food processor and process until smooth and creamy. Transfer to a bowl and serve immediately or chill and serve when ready. Refrigerated, the Creamy Tofu Topping will keep for up to four days. CHESTNUTS ROCK & ROLL OUT OF THE SKILLET! In case you’re wondering if I’ll ever get off this chestnut kick, I can assure you I will– almost immediately because I’ll be leaving on vacation until the end of the year. So, although it saddens me to abandon these tasty little wonders, I must leave the chestnuts behind. But—just one more recipe before I leave—just one more. I concocted this very tasty side dish to use up the batch of fresh chestnuts I had left in the fridge. It turned out so well, I felt compelled to share the recipe. I hope you’ll come up with a better name for this dish than I did. As a matter of fact, please do—I would be in your debt. At this time of year I often see recipes pairing chestnuts and Brussels sprouts. And I’ve even added my own version of the duo. But this little side dish, this wondrous infusion of chestnut and mushroom flavors, is soooo much tastier, yet the seasonings are relatively uncomplicated. If you can find Bunapi or Beech mushrooms (usually Asian markets have them), add an 8-ounce package to the mélange. It’s pure mushroom bliss! 1. Combine the onion, garlic, and water in a large, deep skillet. Cook and stir over high heat for about 3 to 4 minutes, or until the onions are soft and transparent. Add small amounts of water if needed to prevent burning. 2. Add the mushrooms along with 3 to 4 tablespoons of water and cook, stirring constantly for 1 to 2 minutes. 3. Add the remaining ingredients and cook 1 minute longer. Transfer to an attractive serving dish and serve immediately. It must be in my genes to tinker with a recipe. It frustrates my sweet, perplexed husband who tells me the recipe is perfect just the way it is. Still, I tinker, either to improve the flavor, the texture, or the health benefits. In this case, my effort was to see if I could eliminate the olive oil from the previous posting of Garlicky Chestnut Butter and reduce the fat and calories. My concern was whether the chestnut butter would still retain its awesome flavor? Mission accomplished with success! In this second version, the process is the same but the oil is gone and replaced by water. The result is a lighter, creamier chestnut butter with wonderful flavor. Of course, the fresh chestnuts I used are naturally sweet. I ordered them from two chestnut growers: Girolami Farms and Correia Chestnut Farm, both located in Northern California. The recipe is super easy and shows off fresh chestnuts at their best. 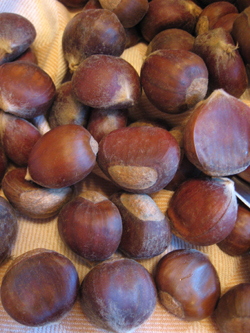 The chestnut season is very short. Most groceries won’t have them available beyond Christmas or New Years. Next trip to the market, buy some fresh chestnuts, cook them using the step-by-step directions below the chestnut butter recipe, and enjoy a luscious, sweet, buttery spread. 1. Combine the onions, garlic, thyme, and 1/4 cup of the water in a skillet and cook and stir over medium-high heat for about 3 to 4 minutes or until the onions are softened. Add a few tablespoons of water as needed to prevent burning. 2. Transfer the mixture to the food processor, add the chestnuts, salt, and the remaining 1/4 cup of water and process for 1 or 2 minutes until smooth and creamy. Spoon the Garlicky Chestnut Butter into an attractive serving bowl, garnish with the parsley, and provide a spreading knife. CHESTNUT BUTTER RULES THE PLANET! Garlic and chestnuts might seem like an unlikely pairing, but wait ‘till you taste this awesome and easy, buttery spread. It has become so addictive I simply can’t keep my fingers out of the bowl. Unfortunately, the little bowl of creamy, brown chestnut butter is not very photogenic so I hope you’ll take your palate on this trip instead of your eyes. In my home, life becomes rosier when chestnuts are on the holiday menu. I can say with confidence that this savory chestnut butter has no equal. With the addition of a bit of kitchen sorcery and a whirl in the food processor, naturally sweet and starchy chestnuts become transformed into an irresistible creamy spread that stands out on any variety of bread or cracker. I love the spread as a filling for celery sticks or spread on carrot, turnip, or Persian cucumber slices. You can take this spread in a different direction by replacing the onions, garlic, and salt with cinnamon, nutmeg, vanilla extract, and a smidgeon of maple syrup to create a sweet spread or filling for baked goods. You can even stuff it into dates and top with a walnut half or a slice of Spanish olive. No doubt, creative cooks will find tons of other reasons to lick this savory-sweet chestnut butter off their fingers. The chestnut butter is a good keeper and retains its flavor for up to 5 days in the refrigerator. For directions on cooking and peeling chestnuts, scroll down to the previous post and you’ll find step-by-step photos and directions. You can even skip the cooking and peeling by buying cooked and peeled chestnuts in jars or vacuum sealed packages during this holiday season. 1. Combine the onions, garlic, olive oil, and thyme in a skillet and cook and stir over medium-high heat for about 3 to 5 minutes or until the onions are softened. Add 1 or 2 tablespoons of water if needed to prevent burning. Add the chestnuts and cook and stir for 1 to 2 minutes longer. 2. Transfer the mixture to the food processor, add the water and salt, and process until smooth and creamy. Spoon the Garlicky Chestnut Butter into an attractive serving bowl, garnish with the parsley, and provide a spreading knife. If you’re a regular NutGourmet visitor, then you’re probably aware I have a passion for chestnuts. Chestnuts are special gems with a very short season. By Christmas they will be a rarity in grocery stores, except for the Asian markets that import Chinese chestnuts. So many people feel intimidated by chestnuts and haven’t the faintest idea how to cook, peel, and even incorporate them into a recipe. American grown chestnuts have just been harvested for the season, so this is the perfect time to jump in and give these wonderful nuts an opportunity to show their stuff in a delicious dish. With the step-by-step guide that follows, you’ll see how easy it is to cook and peel chestnuts and store them until you’re ready to add them to a tasty recipe. Chestnuts have totally won me over. Give them a try—I’ll bet you’ll get hooked on them, too. Step 1: This post shows a criss-cross cut on the chestnuts. I’m updating the technique to one that produces much better results for cooking and peeling the nuts. Using a firm, sharp paring knife, make a horizontal cut completely across the domed or rounded side of each chestnut. If both sides are flat, choose one of the sides for the wide horizontal cut. 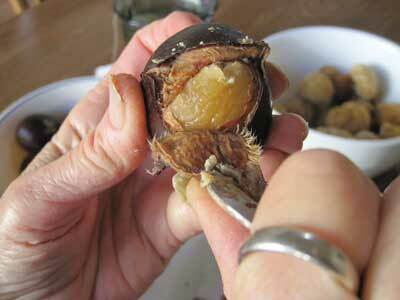 The cuts allow the chestnut to release steam and prevents it from bursting open during cooking. 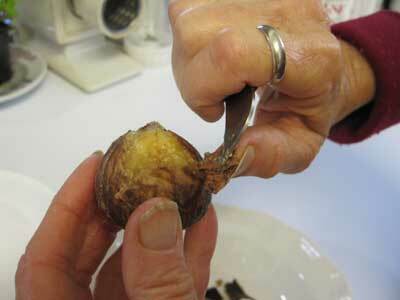 Hold the chestnut firmly with one hand and make the cuts with the other. 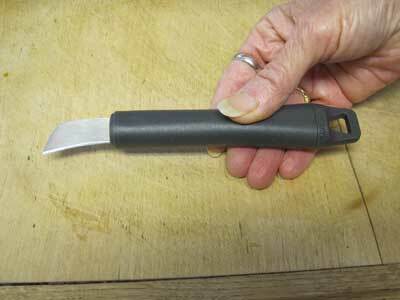 Use a very firm paring knife with a 3-inch pointed blade. Don’t be timid. 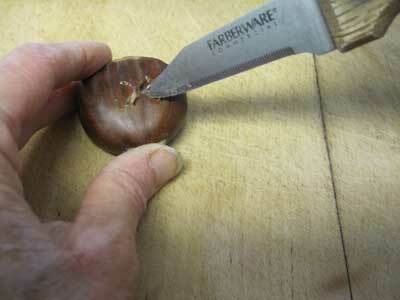 Poke the tip of the knife right into the chestnut, about 1/4-inch to 3/8-inch deep. 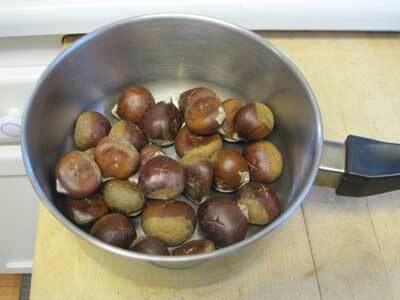 Step 2: Put the cut chestnuts into a saucepan and add enough water to cover the nuts by about three inches. Cover the pot and bring it to a boil over high heat. Reduce the heat to medium and simmer the chestnuts for 25 to 35 minutes. Then, turn off the heat. The shorter time will result in firm chestnuts. Longer cooking will make them softer to use in puddings and creamy recipes. 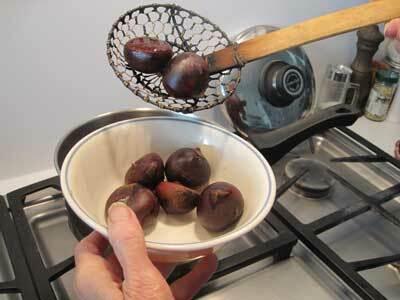 Step 3: Use a slotted spoon to remove only a few chestnuts at a time from the pot and put them into a small bowl. You’ll notice the horizontal cut allowed the shell to pull back, making it much easier to peel. The nuts peel much easier when they are quite warm. Have ready a bowl for the discarded nut shells and another bowl for the peeled chestnuts. Step 4: Now you’re ready to peel. 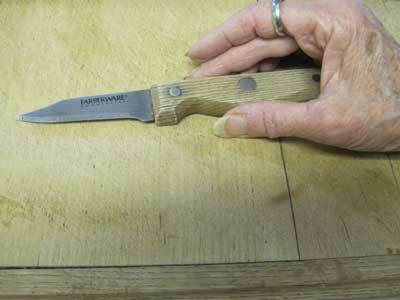 You can use the firm paring knife or a chestnut knife with the very short, curved blade. Fix yourself a nice cup of tea and prepare for a relaxed peeling session that might take 20 to 30 minutes depending on how many chestnuts you’ve cooked. Poke the point of the knife into the cut and pull up on the peel. Step 5: Chestnuts have a hard outer shell and an inner soft skin called the pellicle. Sometimes both the outer shell and inner skin will come off together, but occasionally, they’ll have to be peeled away separately. 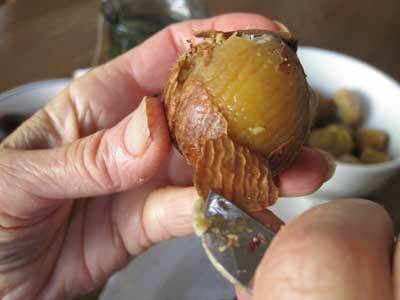 I hope you’ve rewarded yourself and tasted a few tidbits of broken chestnuts during the peeling session. The cooked and peeled chestnuts are now ready for incorporating into a recipe. Storing the Chestnuts: If you plan to use the chestnuts within two or three days, cover them with plastic wrap and store them in the coldest part of the refrigerator. 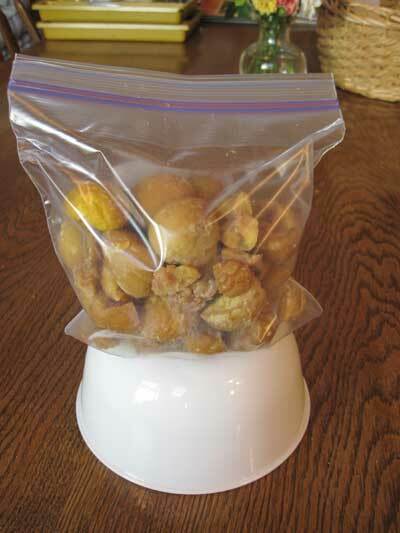 For longer storage, put them into a heavy-duty plastic bag and freeze them. Allow several hours to defrost at room temperature before using. 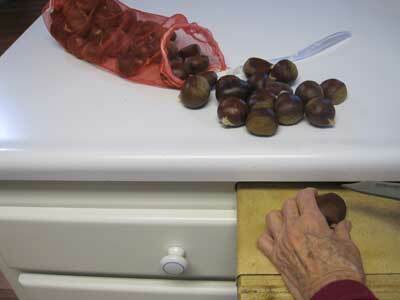 Defrosting chestnuts in the refrigerator will result in mushy nuts. Chestnuts are practically fat free! There’s nothing like them on the planet. Their appearance, flavor, and texture are not like any familiar nuts such as almonds or walnuts, yet they are classified as tree nuts. Chestnuts can be eaten raw but deliver far better flavor and texture with cooking. 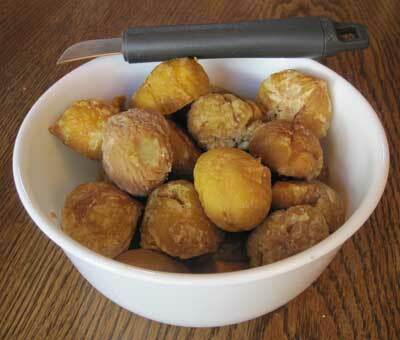 Once cooked, they are sweet with a creamy texture similar to cooked potatoes. You can incorporate cooked chestnuts into beverages, soups, salads, stir-fries, casseroles, puddings, pies, and baked goods and desserts of all kinds. Ready for a delicious chestnut side dish for the Thanksgiving feast? A stunning dish with rich, complex flavors, this delectable stuffed spinach roll is a winning company entrée with irresistible charm. American grown chestnuts, delightful in texture and flavor, add a delicate sweetness that enriches the creamed stuffing. For optimal success, prepare both the spinach roll and the stuffing a day ahead and store them in the refrigerator separately. To prevent the spinach layer from becoming soggy, assemble the dish and warm it at 350 degrees for 15 to 20 minutes close to serving time. 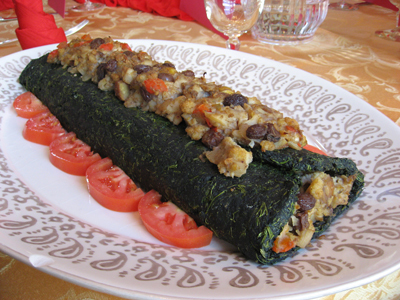 The Roulade can be warming while serving the salad or appetizer course. 1. TO MAKE THE SPINACH ROLL, preheat the oven to 325 degrees and line a large jellyroll pan with parchment paper. Lightly oil the parchment and set aside. 2. Place the frozen spinach into a 4-quart saucepan, add 1/2 cup of the water, and cover the pan. Cook over high heat for 2 minutes, reduce the heat to medium, and cook about 3 minutes. Lift the cover, stir the spinach, replace the cover and cook about 6 minutes, or until the spinach is fully cooked. 3. Drain the water and squeeze the spinach through the fingers until it is bone dry. This step will take several minutes but is important to the success of the recipe. When the spinach is completely dry, place it into a large bowl. 4. Combine the powdered egg replacer and the remaining 1/2 cup plus 2 tablespoons water in a small bowl and beat with a fork until thoroughly combined and foamy. Add it to the cooked spinach and mix thoroughly. 5. Add the salt and pepper, mix well, and spoon the spinach mixture onto the prepared jellyroll pan. Use the back of a spoon or a fork to spread the spinach into a rectangle approximately 9 1/2 x 13 inches. Bake the spinach for 20 to 25 minutes, remove it from the oven, and allow it to cool completely. Cover the jellyroll pan entirely with plastic wrap and store it in the refrigerator for several hours or overnight. 6. TO MAKE THE CHESTNUT VEGGIE STUFFING, heat the olive oil in a large, deep skillet. Add the cauliflower, bell pepper, quartered chestnuts, onions, raisins, garlic, and cinnamon. Cook over high heat, stirring frequently, for about 5 minutes, or until the vegetables are softened. Reduce the heat to medium. 7. Combine the soymilk and the 1/2 cup whole chestnuts in the blender and process until creamy. Add the creamy mixture to the cooked chestnut-vegetable medley and cook for about 1 to 2 minutes, stirring frequently, or until the mixture is thoroughly combined and thickened. Season the veggie stuffing with salt, pepper, and cayenne, if using. 8. TO ASSEMBLE THE ROULADE, preheat the oven to 350 degrees. Remove the spinach roll from the refrigerator and remove the plastic wrap. Place a clean sheet of parchment over the spinach roll, cover with another jellyroll pan, and invert the pan. Carefully remove the top layer of parchment and bake the spinach roll, uncovered, for 5 minutes to remove excess moisture. 9. Set aside 1 cup of the Chestnut Veggie Stuffing and spoon the remainder onto the spinach layer, placing it lengthwise down the center. 10. Lift one side of the parchment and use a knife to release the spinach roll from the parchment, if needed, folding it over the stuffing. Lift the other side of the parchment and fold the spinach over the stuffing. Use your hands to overlap the spinach roll and completely enclose the stuffing. 11. Bake, uncovered, for 15 to 20 minutes to warm through. While the Roulade is warming, spoon the reserved stuffing into a small saucepan and warm over medium-low heat. 12. Remove the Roulade from the oven and use a flatware knife to carefully slide it toward the edge of the parchment. Lift the parchment, Roulade and all, off the jellyroll pan and onto an oval or rectangular serving platter. Gently push the Roulade completely off the parchment and center it on the platter. Spoon the warmed stuffing over the Roulade lengthwise down the center. 13. TO GARNISH AND SERVE THE ROULADE, line both sides of the Roulade with the cucumber slices, cut side facing inward, and place a cherry tomato half on top of each cucumber half. Lightly sprinkle the top of the Chestnut Veggie Stuffing with paprika and minced herbs. Use a sharp, serrated knife to cut the Roulade into serving portions. I place a high value on fresh chestnuts for the seasonal nuance and the ambrosial quality they bring to a dish. I’ve even attempted to substitute with potatoes or sweet potatoes because of their starchy nature, but neither measures up to the real thing. Nothing quite takes the place of the fresh chestnut. Invite them to dinner and perhaps they’ll become as high on your holiday shopping list as they have on mine.